Video game consoles are illegal in China. Ironically, the Wii, the PS3 and the Xbox 360 are Chinese made. And there is a flourishing PC gaming culture. There has to be a reason for this ban. Turns out, there is. "Consoles have been banned in China since the year 2000," Lisa Hanson from market researcher Niko Partners tells Kotaku. "The government thought that was the best way to protect Chinese youth from wasting their minds on video games, after a parental outcry." The following year, online gaming exploded, and the market size hit $100 million. So the ban, Hanson says, "didn't stop the 'problem'." A recent article on Chinese news site Sina.com points out, "In June 2000, the Ministry of Culture issued a notice, forbidding any company or individual to produce and sell electronic game equipment and accessories to China." Plug'n'play consoles became a legal alternative to the banned home consoles. Nintendo released the iQue Player, a console it developed with software developer Wei Yen, whose California-based company AiLive co-created the Wii MotionPlus. The iQue Player was priced at US$60, and it is not a pure plug'n'play per se. Players can play Nintendo 64 games like Super Mario 64, The Legend of Zelda: Ocarina of Time, and Super Smash Bros. that were specifically ported to the system. To get new games, players go to their local game retailer, where they can download more titles onto a 64MB flash memory card. The cartridge is slotted directly into the controller, which houses the console. "We have targeted people in developed countries such as Japan, the US and Europe with sophisticated machines," Nintendo president Satoru Iwata said back in 2003. "To reach a wide range of people in China, especially those inland who are not as rich as those in coastal areas, we thought we needed to deliver a cheaper console." And to legally sell a video game console in China, it had to sell something that not only didn't quite look like a video game console and couldn't be pirated to Timbuktu and back. (That's not to say the iQue Player is piracy free!) 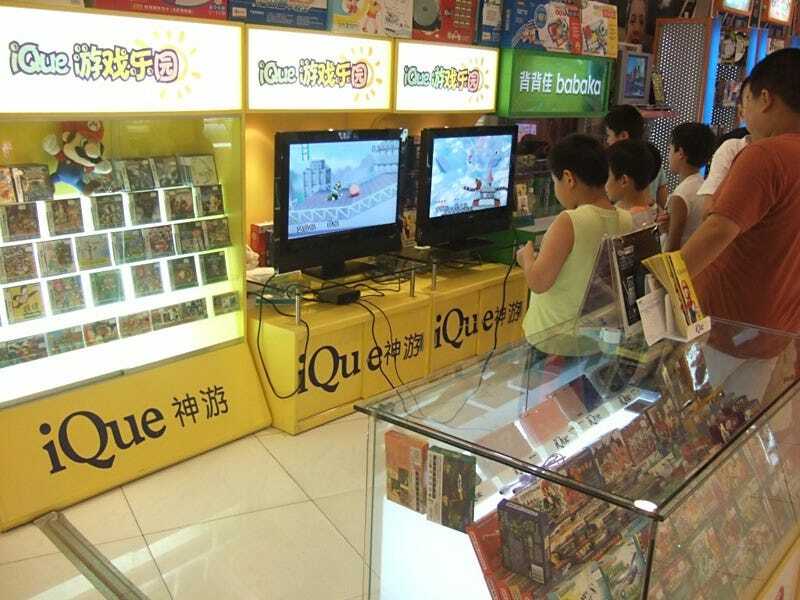 Since then, Nintendo has used the "iQue" brand in China for its characters and products. Software piracy is a huge problem in China, and that might be why game companies are hesitant to enter the Chinese market, but it's not why video games have been outlawed. Nintendo legally released its portable Nintendo DSi in Chinese stores in December 2009. Nintendo has yet to release its Nintendo Wii in mainland China. Likewise, neither Sony nor Microsoft have released their consoles in the mainland. Sony and Microsoft, however, do have Hong Kong branches and have released their home consoles in that territory. Heck, there are even PS3 demo units at the Hong Kong airport. Sony might still be smarting to what happened to the PS2. The console ban does exist on paper, but it is not strictly enforced. Piracy, on the other hand, is doing more to keep game consoles out of China than any government edict ever could. Sony released the PlayStation 2 in China in January 2004. The launch was a disaster with rampant game piracy and of the hardware itself. While it wasn't exactly the financial success Sony might have been hoping for, it did build a brand name for the company. Nintendo's Wii has been copied by a Chinese company and released as the "Vii", a game system that runs preloaded motion controlled games. Sony's PS3 has been knocked off as "The Winner". Pirated versions of console and PC games are prevalent. There are also cafes that offer players the chance to play video game consoles. Game consoles do make their way into China through the gray market, where they are bought and sold illegally. Hanson at Niko Partners points out that gamers get their gray market consoles modded so they can play pirated games for either free or on the cheap. "The PS3 is hard to play pirated games on," says Hanson,"so it has the lowest share of the three brands." There is no regulatory body to oversee video game consoles, creating a bureaucratic quagmire for the ban. Hanson, however, speculates that the Ministry of Culture might eventually get that role. Since there is no body to monitor the game consoles, there is no governmental body to determine whether or not to overturn the ban on consoles, creating a Catch-22. Until then, expect that gray market sales will continue to dominate, if anything out of necessity.